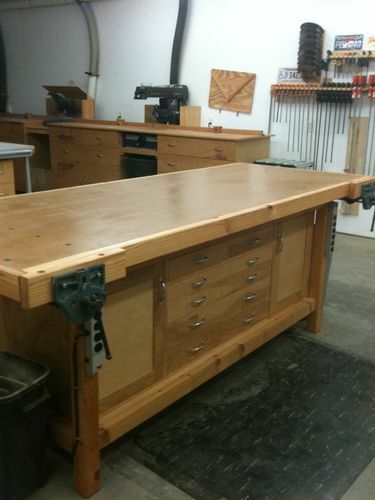 I moved my old workbench to our farm in Michigan so I needed a new workbench for my shop in Tallahassee. For this project I decided to design my own heavy duty workbench rather than work off existing plans. My primary inspiration for this design came from studying highway overpass bridges while traveling on major interstates. I liked the massive supports and columns used by the engineers when they designed the bridges. I thought it would be neat to use a similar style in a workbench design. I designed the bench to have a vise integrated into the base, rather than attached to the top. This way I could swap out a top any time I needed. For the first top, I used an old torsion box my son and I built for an assembly table several years ago. I used 1/4” birch plywood for the top layer (screwed not glued down). The bench would have easily accommodated a heavy timber top, dimensioned lumber or even laid up flat stock. After the timbers were cut to length, there was a lot of hours of mortising and chiseling. I would have given my right arm for a chain mortiser. All tenons where pinned using 3/4” oak dowels. The project was delayed for a week due to Hurricane Michael. Luckily, Tallahassee missed the worst of the storm but there was still a lot of cleanup and no power for three days. I finally finished it today and here is the result. This is as nice as it will ever get as I have a large backlog of woodworking projects on my TODO list and I expect it will get a beating. Stellar job on the bench build…..Very massive and truly heavy duty….It should take pounding or whatever you put it through…..Nice….!! Nice Job & Well Done Scott! very impressive bench my friend !!!!!! That is a massive and nice bench. Quite unique. Well done. Thanks! I forgot to add that I also added heavy leather to the vise faces. You will surely benefit from storage under the bench, and a power strip or two to have mounted on your bench….Those come in very handy for sanding, any electrical projects you do, run a shop vac, etc. Here’s my bench I made many years ago…It has all of the essentials…...!! I like the dovetailed stretchers on the bottom. I’m wondering if those projections of the supports beyond the top will get in the way, or if they will have some function that I’m too inexperienced to realize. Looks great Rick. That is exactly what I had planned! You will surely benefit from storage under the bench, and a power strip or two to have mounted on your bench….Those come in very handy for sanding, any electrical projects you do, run a shop vac, etc. Here s my bench I made many years ago…It has all of the essentials…...!! I honestly don’t know if they will ever get in the way or not. However, I can certainly use them to lay a long board on edge and clamp for jointing. I m wondering if those projections of the supports beyond the top will get in the way, or if they will have some function that I m too inexperienced to realize. ... I can certainly use them to lay a long board on edge and clamp for jointing. I wasn’t sure of the construction of your top – if you had a way to clamp to the apron. That sounds useful to me for planing the edge of long boards. Its just an old flat torsion box I built several years ago. Mainly I need a good flat surface for assembly and handwork. I rarely edge joint by hand since I have a nice power jointer. More helpful to me will be to add some bench dogs to the table and vise. I wasn t sure of the construction of your top – if you had a way to clamp to the apron. That sounds useful to me for planing the edge of long boards.